MDF home diagnostic products consist of sphygmomanometers and their supporting cuffs. Blood pressure cuffs come in two styles: single or double tube. 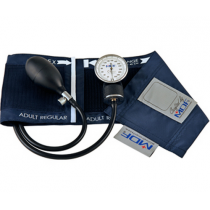 These blood pressure cuffs are inflated, and along with the help of a stethoscope and mechanical dial, can accurately report blood pressure. A person may use a blood pressure for home diagnostics if they are at risk for too low or too high of blood pressure. Aneroid sphygmomanometers by MDF are designed as separate pieces, on stand alone carts or even in a wall mounting style. Wall Aneroids have a large dial screen for enhanced ease of use.